Streetwear is so ubiquitous that its name doesn’t really do it justice these days. It’s no longer just for skaters oblivious to fashion. Nor is it a cooler-than-cool subculture for people who wear everything first. Right now, streetwear is a certified menswear phenomenon, mainstream fashion and haute couture, price-tag depend. For proof this statement isn’t a load of hype about hype, you only need to look as far as the luxury world, in which titans like Burberry and Louis Vuitton have swapped tradition for ultra-stylised comfort and utility. If you want to inject the same level of swag into your line-up but don’t spend your days tearing up half-pipes, we’ve got eight expert-approved ways to level up your streetwear game for the coming season. And the good news is that streetwear is made for autumn-winter: layering, oversized fits, different textures and weatherproof sneakers. Call it extreme indecisiveness, call it flying in the face of all sound logic, but layering hard has become the streetwear kid’s new modus operandi. The results may be varied, but that autumn chill doesn’t stand a chance. Nailing the look isn’t so much a case of exact science, it’s more a game of intuition, bravery and a dollop of good luck. Ease into it by layering an overcoat over a hoodie and sports jacket, or go one further by letting a roll neck creep out from under a crew or V-neck jumper. If the overall ‘fit looks like something that’d cause pub punters to spit out their pints, you’re probably doing it right. Unless you’ve been living underneath a particularly cumbersome rock of late, you’ll have noticed that equally chunky trainers are having a serious moment. It’s a bold look and one that’s certainly not for everyone, but the rebirth of fractionally less obtrusive throwback styles is something that should definitely be on the everyman’s radar. Thankfully, these semi-bulky stompers are more straightforward to style. Match with loose-fitting trousers and a logo hoodie; or pair with a tracksuit, dad cap and cross-body bag for best results. It’s no secret that the world of menswear loves to take its cues from the military. However, it’s usually historic garments like the field jacket that it aims to emulate. The so-called ‘warcore’ trend is different in that the clothes look like they’ve been pulled straight out of Modern Warfare 2 as opposed to the trenches of actual World War II. Nailing this trend is all about getting your colours and styles right. Think dark, moody tones, aerodynamic cuts and plenty of technical materials and features. Or, to pull it off with little investment, dig out some camouflage pieces that have been knocking around for seasons and layering them up in new ways. Old school preppy style is generally hallmarked by its strait-laced conservatism, so it’s hardly fertile picking ground for streetwear kids who pride themselves on looking unbothered as a full-time occupation. But, in a surprise to pretty much everyone, it’s been reappropriated, remixed and is now a world away from the slick-haired Ivy Leaguers. It goes without saying that to go full streetwear these preppy staples need companions that your old professor would baulk at. Try teaming a rugby shirt with a pair of relaxed leg trousers and retro trainers, and if you really want to shake the establishment, stick on a bucket hat to blow their Harvard-educated minds. Stepping out onto the street, you’d be forgiven for thinking you’d fallen through a rip in the fabric of space and time to end slap bang in the middle of the ’90s. If it weren’t for the mobile phones, of course. After lying dormant for a hot minute, sportswear brands from the era are having a second crack at glory. There’s more too it than simply sticking on an Ali-G shellsuit, mind. You’ll need to employ some subtlety to ensure you’re more street than street corner. For novices, stick to one piece of retro sportswear such as a branded anorak as a nod to the decade. 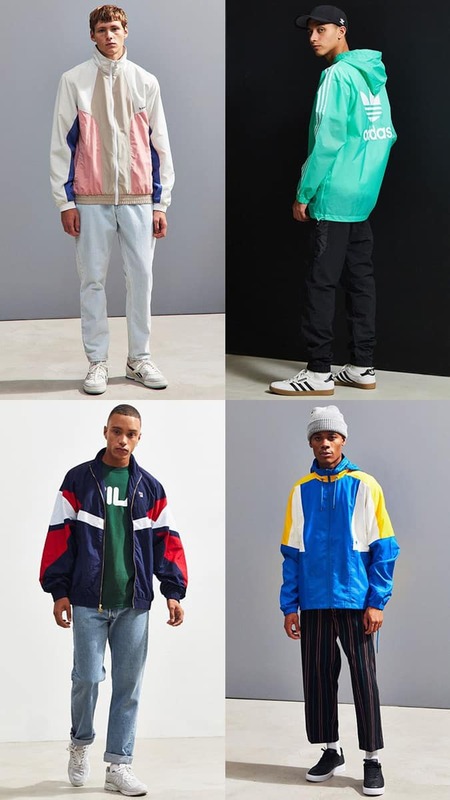 Those with heavily rose tinted specs can amp up the nostalgia by opting for a full tracksuit, but should look for a slim cut and some discernibly modern sneakers. In keeping with menswear’s fervent idolisation of your dad’s duds, streetwear has started copping classics that your old man’s been wearing for years. This time though, it’s not the turn of the millennium that’s being plundered, but the murky depths of the seventies. Bear in mind that there’s a fine line between full Saturday Night Fever and contemporary streetwear skuz. To land safely in the latter category, you’ll need to go easy on the vintage threads and stick to the one piece rule. A fur-lined aviator or fleece worn over a tracksuit is all you’ll need to nail the look. Who knew looking so knowingly disreputable would be such a cinch. Being transparent is not usually something many would take pride in, but for the streetwear set this season, showing your motives is all the rage. Translucent materials have from gone laughably impractical to absolute essential, giving the streetwear crowd greater chance to show off their carefully curated brand line-up. Copping a pair of see-through kicks might sound easy, but it’s categories like outerwear where things get a little trickier. Just make sure the rest of your outfit is in a simple palette (read: navy, grey, black, khaki, cream). Unless that is, you’re looking to get papped at fashion week, in which case, go for batshit crazy neon as your base. Graphic denim may sound like the kind of thing that your little sister used to dedicate Saturday afternoons to perfecting, but this arts and crafts approach to legwear has probably been adopted by the streetwear crowd. Though, they’ve probably not put in the same amount of elbow grease as your sister. “Patches and pattern work on denim is not entirely a new idea,” says Tang. “The Japanese market has long explored using denim as a canvas.” It’s only recently though that streetwear fans have got their mitts on the goods. The key to wearing altered denim pieces well is to let your chosen design speak for itself. Finishing a look comprising a chore jacket, white T-shirt and minimalist sneakers with some patchwork denim for a look that marks you out as a man not afraid to put the work in (even if it is only in the Supreme queue).